Fellow Canadians: What Are The Costs of Ignoring Facts, Silence, and Inaction? Challenging a $10.5 million payout to Omar Khadr. 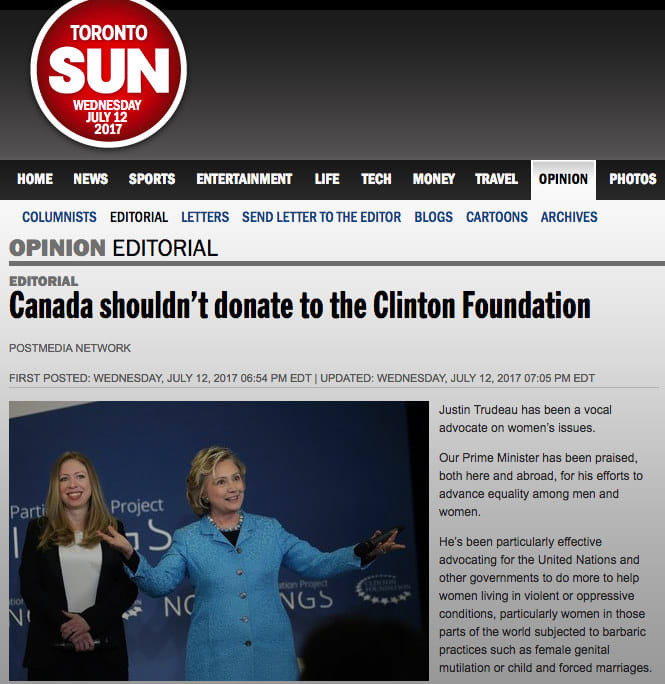 Does the Canadian Taxpayers Federation plan to challenge a $241.5 million donation to the Clinton Foundation under investigation by the IRS and Judicial Watch? Research reveals the Clinton Foundation is embroiled in controversy regarding the mixing of philanthropy, for-profit business, friendships with wealthy individuals, corporate interests, foreign interests, and politics. 8:54 minutes: The point being that if you were a Foundation donor you had an in with the Clinton State Department. To be clear, if you were a Clinton donor you had an in with the State Department. You could get the attention of the top officials of the State Department through The Clinton Foundation, there were Ambassador appointments talked about as a result of being affiliated with the Clinton Foundation and that’s pretty serious. The True North’s strength and freedom are fading. Canadians need to let George Soros know that we are not for hire. What’s happening to Canada requires Canadians to speak up. We need to write, phone, email, visit government representatives in person to let our ’employees’ know they are accountable for how our tax dollars are spent, accountable to make decisions that support and sustain the health and welfare of our people and Nation based in natural law; do no harm and do not allow others to harm. Please share this message and thank you.